As a Sydneysider, you could be forgiven for taking the Harbour Bridge and Opera House for granted. and Joern Utzon's controversial concert hall. You'll Ooh! and Aah! like an over-excited overseas tourist as the ferry approaches Circular Quay and our most famous icons come into view on either side, larger-than-life and glinting gloriously in the sunlight. The Manly Ferry is also as cheap as chips - making it an affordable alternative to paying hundreds of dollars for opera tickets, or to scale the big bridge in a spacesuit. 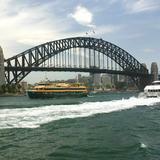 Not that these aren't great things to do as well, but if you're on a budget and looking for an outstanding outing, a $6.40 ticket on the ferry - which leaves from Manly Wharf / Circular Quay about every half hour - is a top option. Tip: Try to board the ferry early to make sure you get a sought-after outside possie.